“You’re not leaving the table until you finish your broccoli!” Sounds familiar to most of us. Well, it turns out that Mom knew best. In addition to being an excellent source of vitamin C, vitamin K and folate, broccoli also has been shown to have anti-cancer, anti-inflammatory and antioxidant properties. It’s no secret that broccoli gets a bad rap. But broccoli doesn’t have to be mushy and odorous — which happens when broccoli is over cooked. When prepared well, broccoli can be so delicious that you may see your family’s objections turn into requests. So go ahead, and as Mom said, eat your broccoli. 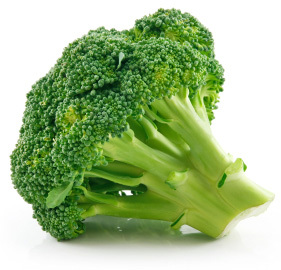 Choose broccoli that has tight, compact florets. The tips of the broccoli florets should feel firm. Florets that are starting to yellow or have blossoming flowers should be avoided, as those are signs that the broccoli is past maturity. Store broccoli in a plastic bag in the refrigerator. Do not wash it until you are ready to use it, as moisture expedites spoilage. Do not cut broccoli into florets until you are ready to use it either, as the vitamin C content quickly declines after broccoli is cut. There are many ways to prepare broccoli. Although roasting is my personal favorite, I would recommend any of these methods. The only method I would not recommend, and therefore did not include, is boiling. Most of the nutrients leech into the water when broccoli is boiled and then that water is discarded, resulting in increased nutrient loss. Steamed: For an ultra-simple way to prepare broccoli, place the florets in a steamer basket above simmering water, cover and cook for five to six minutes. Toss with a pat of butter, sea salt and fresh lemon juice. Stir-fried: Heat sesame or vegetable oil in a wok over medium-high heat and fry broccoli florets until they just start to brown. Add in a little minced garlic and ginger, a splash of soy sauce and a bit of water and continue to cook until the broccoli is crisp-tender. Pureed in a soup: Because broccoli cooks so fast, creamy broccoli soup is one of the easiest and fastest soups to make. Simply sauté diced onion, celery and broccoli in butter until softened, and then add in a few cups of chicken or vegetable stock. Simmer for about 10 minutes, and then puree until smooth and stir in a little cream. Roasted: This is my favorite way to prepare broccoli. Roasting brings out a sweetness and richness that you never knew broccoli had. I always roast it in a hot, hot oven in a little olive oil and salt and pepper. Once lovely and caramelized, toss the oven-roasted broccoli with whatever you like, but my favorite way to prepare it is with lemon juice and zest, sliced almonds and shaved Parmesan cheese. Preheat oven to 425 degrees F. Cut up the broccoli into medium sized florets. Toss the florets in olive oil on a large rimmed baking dish and season generously with salt and pepper. Roast for about 20 minutes, adding in sliced garlic about four minutes before it is finished roasting. 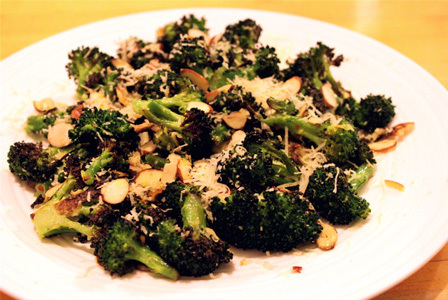 Remove the broccoli from the oven and toss with the lemon zest, lemon juice, crushed red pepper, almonds and Parmesan cheese and serve immediately.